SlideShare’s quick rise to prominence caught content marketers off their guards. Now, some of the world’s biggest brands (including GE, IBM, and HP, among others) consider it a top content distribution channel. So, how did an upstart presentation engine crack the top 150 most visited websites in the world? The secret is in the search itself. To be more specific, SlideShare is incredibly search-friendly — in fact, the website’s engineers built the site with search optimization in mind. The platform attains SEO superstardom by automatically transcribing copy from uploaded presentations. The search value of this is incredible. Since a strong search presence is a huge boost for content marketing, SlideShare could be just what your brand needs for more successful content marketing. Think of SlideShare’s link juice as rocket fuel for the content you post on the platform. All you need to start borrowing some of the professional network’s clout is a coordinated plan. 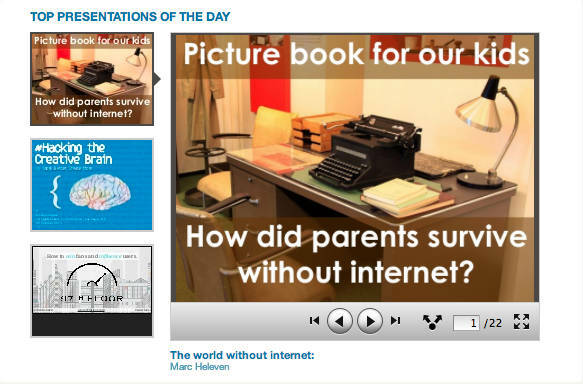 In general, SlideShare benefits from typical SEO best practices. So when it comes to successful content marketing, starting with careful research on relevant keywords — and where your brand currently ranks — should be a given. Applying this research to SlideShare content creation is how you formulate a plan. Below is a guide on how to take SlideShare’s built-in search friendliness to the next level. Step 1: Build content around the search terms your business dominates: Brands competing for visibility on dominated search terms have a friend in SlideShare. Borrowing on the website’s search-friendliness is a shortcut to claiming keywords for your brand. Even large and well-known brands can’t always get a grip on the search terms that are crucial for their business. In an ideal world, you get link juice for your website. Using SlideShare as a juice-booster is a strong option if the competition is too well entrenched. This path is especially effective if lead generation is your goal. 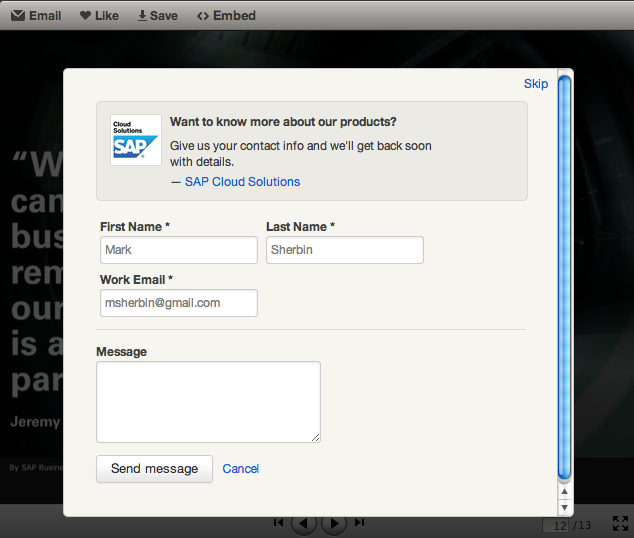 SlideShare’s built-in lead form simplifies lead capture. Your presentation doesn’t have to have the means — it can be the end itself. Anytime you upload a presentation, the technology crawls the presentation for words, replicating them for HTML placement and a beefed up search presence. SlideShare’s automatic word transfer (marked as the “presentation transcript” in the bottom portion of your presentation page) means all of that presentation copy you worked so hard on becomes a huge search asset. Not surprisingly, a bigger time investment in your content pays off for SEO. Step 2: Spend time crafting a search-friendly title: The “title” field of your SlideShare presentation corresponds to your typical browser title. It could be based on the headline of your designed presentation file. It could also be something more keyword-specific. Whatever it is, it’s what people will see when they search for your keywords. Tip: Keep your title short (i.e., fewer than 70 characters), descriptive, and relevant. In the long run, it’s still more important to have a compelling and provocative headline than it is to have a generic one. Coupled with keywords, a strong headline is an advantage for your SlideShare content. 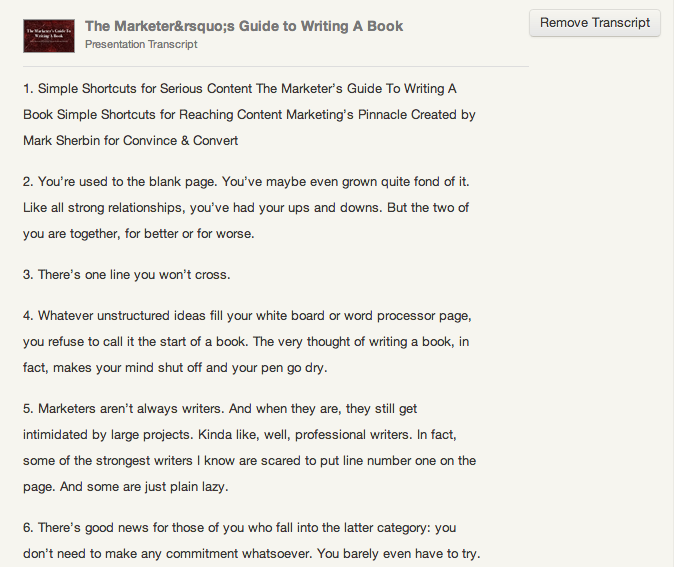 When you upload a presentation, SlideShare prompts you to add a description. But this is more than just a preview of the piece for social networks — it’s also an SEO tool. Tip: Write an accurate and catchy description for your presentation. But don’t forget to integrate the keywords for which you’re hoping to rank. Do it naturally, being careful to avoid keyword stuffing. SlideShare’s tagging feature is unique to the platform’s search function. It draws attention to your content by helping presentations show up in more onsite searches. You can add up to 20 different tags per presentation. Unfortunately, tags don’t have the same power as meta-keywords—specific elements that give search engines a head start on categorizing pages. But they do add normal keywords to your presentation, which still creates a boost in search juice for those keywords. Like any SEO tactic, you want your presentations to gain footholds across the web. SlideShare presentations are embeddable, making them easy for viewers to spread the word by sharing them on their own sites and social networks. The more places you can embed your presentations, the more authority they’ll receive on search engine results pages (SERPs). So, if you can convince other blogs and websites to run your presentation, that’ll help boost its SEO value. 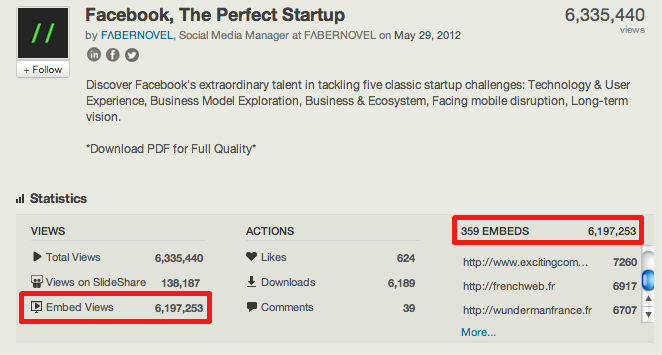 Innovation agency faberNovel’s Facebook, The Perfect Startup is one of the most popular SlideShare presentations of all time; it’s a powerhouse piece of content that has logged more than 6 million views. That clout stems from some 360 embeds, including on major websites like TechCrunch. Tip: Create short blog posts around new SlideShare presentations you have created, and embed those presentations into the posts themselves, as well. And if you convert older blog posts into SlideShare presentations, make sure you go back into those posts and update them with the SlideShare embed. Quality is a top priority. But quantity is still important to a successful content marketing strategy, as it increases the chances that your business’ content will be found. While it may seem like a no-brainer, producing enough content becomes less of a challenge when you start recycling the content you have already created, such as your business’ blog posts, white papers, or web copy, into new SlideShare presentations. Tip: In some cases, organizations may think that producing more SlideShare content is cost-restrictive, particularly when it comes to design. To save on design resources, SlideShare solutions consultant Kevin Fisher suggests using big, beautiful fonts in your text, to make presentations more eye catching — even if you are unable to incorporate actual images in your presentations. Eye-catching text is an easy design strategy that content marketers can use without paying a pro. For example, Haiku Deck is a cheap option for text design (if you own an iPad). That isn’t to say you should skimp on design when you can afford it, especially for your best and most extensive pieces of content. Cover page design is crucial for grabbing visitors’ attention and drawing them into the presentation, for example. But you can’t always get a designer involved, and for those projects it helps to have an inexpensive and time-saving option on hand. How do your SlideShare presentations rank for certain keywords? 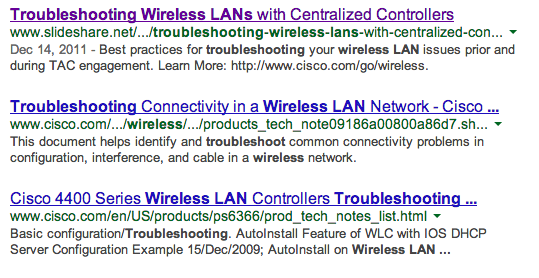 Let us know why you think certain pieces of content perform well in search results. Looking to improve the performance of your SlideShare presentations? Check out CMI’s latest e-book, How to Get More From SlideShare: Super-Simple Tips for Content Marketing. Mark Sherbin is a freelance writer specializing in technology and content marketing. He shares occasionally insightful information at Copywriting Is Dead, where he promotes authentic communication between organizations and their audiences. Contact him at msherbin@gmail.com.